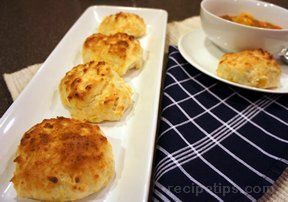 Served warm, these buttery cornmeal and cheese biscuits are an excellent accompaniment for soups, stews, or salads. In a large bowl stir together the flour, cornmeal, baking soda, baking powder and salt. 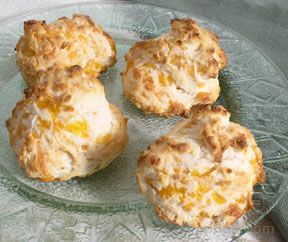 Mix in the butter chunks with a fork or pastry blender until the dough resembles coarse meal. Stir in the cheese and add the buttermilk. Stir with a fork until all is incorporated and combined. Place on a floured surface and roll out into a 1/2 inch thick circle. 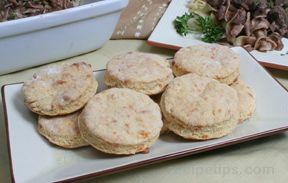 Cut dough with a biscuit cutter or a glass with a 2 inch circumference. Place discs on the baking sheet. Form the remaining dough into another 1/2 inch thick circle. Cut out 4 more biscuits. 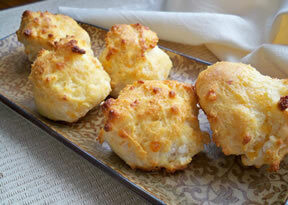 Bake until light golden brown, approximately 10-12 minutes.